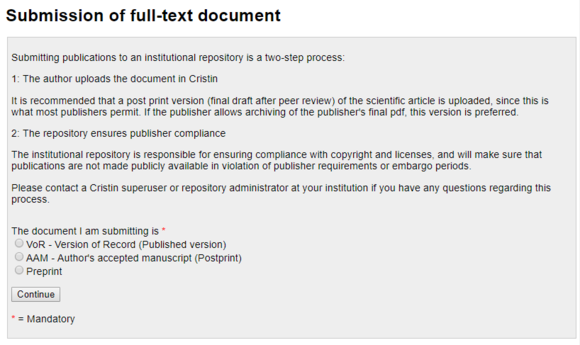 Find the lastest version of the manuscript after peer review and make a PDF version of the file. Click on "Deliver full-text document" to move on. Choose the type of version that corresponds with your document and click "Continue"
Retrieve the full-text document file from the server, your hard drive etc. uploaded file and checks the file up against the publisher's policy. The library checks for embargo and registers this in USN Open Archive. More about why Open Access is important for you as a researcher can be found here. More information about self-archiving/parallel publishing can be found here.